KJS: Sean ... please tell the folks about how we crossed paths - how we came to meet up? SMP: My band Fragile X did a cover of “Turn to Stone” and it was posted on the ELO Discovery web site by Nico, their web master! Fragile X were listed on the site next to an ELO compilation album. I was experimenting with various ideas on how to market my newest band called Imaginos at the time. I saw that there was a growing interest in the music of Fragile X, so I began researching various ways in marketing the music. 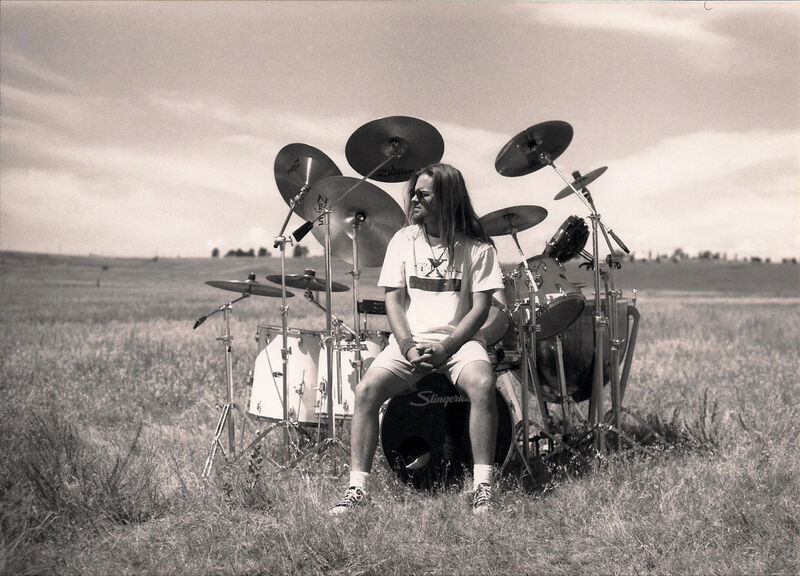 Jason Brown, the drummer for Burn Sand Burn [a local band in the Denver area] told me about MySpace and that eventually led me to pursue Facebook and Reverbnation; both being vehicles to help promote my music! From that point, I believe we began talking over on Facebook about our mutual ELO interest! This was the beginning of our friendship! KJS: Can you tell me about your physical and musical backgrounds? SMP: I have always had an interest in drums and music ever since I can remember! I practically wore out my grandparents 'America' record listening to "Horse With No Name"! I used to listen to "Turn To Stone" and "Sweet Talkin' Woman" by ELO on the AM transistor radio hanging from the handle bars of my bicycle before I really knew who they were! When I was nine  years old, I was injured severely by a gunshot; thus I strived to find some method of fitting in and being accepted. Over the years, I tried several musical instruments including drums and percussion. Drums were very beneficial, and helped me cope with my Post Traumatic Stress Disorder [PTSD] throughout the years - without actually being diagnosed professionally! During my freshman year in High School, Karl Knox, a friend of mine in a marching band, sold me an old beat-up 'Rogers' Drum Kit - that was incomplete! I knew within a week that drums are what I wanted to play! When I was sixteen  years old, I got a new black 'Ludwig' drum kit for Christmas! I was ecstatic to say the least. I always loved the 'Rock' genre, and was especially interested and influenced by ELO and my idol Bev Bevan, their drummer. I also enjoy metal, classical, big band era, oldies and all of these music styles influenced my playing! I am now finally in recovery from PTSD and I wanted to share my story with others to let them know how healing music can be! It is very good that I have incredible support from friends and family. I am truly blessed, and very grateful for my life. KJS: What bands were [and are] your musical influences [besides ELO of course!]? SMP: I can’t help myself Keith! ELO; ELO Part II; The Move; Rush; Pink Floyd; Savatage; The Guess Who; Evanescence; Black Sabbath; Led Zeppelin; Slayer; Metallica; Metal Church; King Crimson; Mozart; Bach; Beethoven and Vivaldi are definite influences - to name a few! I love all the musicians that played in ELO over the years!! Bev Bevan and Kelly Groucutt will always be very special to me! When I opened for ELO Part II in 1996, I got to meet everybody and spend time backstage with the whole group - a dream come true! I enjoy the amazing writing of Jeff Lynne! My other favourite musicians are: Neal Peart; Alex Lifeson; Geddy Lee [Rush]; Tony Iommi; Bill Ward and Geezer Butler from Black Sabbath. My first record was "Herman's Hermits Greatest Hits" so I also have to list them as one of my early influences! "Mrs. Brown certainly had a lovely daughter!" Other drummers that I like are: Gene Krupa; Carl Palmer [ELP; Asia]; Steve "Doc" Walchoz and Jimmy Vincent [Louis Prema Orchestra]. Jimmy did a mean "Sing, Sing, Sing"! Buddy Rich; Butch Miles and Sandy Nelson are awesome drummers too! KJS: You have [and continue to be with some of them] a member of quite a few bands Sean! Onyx Rook; Cat Bleu; Navigator; Fragile X; Imaginos to name a few! Can you tell me about those bands and what they were [or are] about? SMP: Currently, I am actively working with all these bands. That is partially the reason that I have taken so long in getting this interview finished for you, Keith! Onyx Rook was my first real band; it was heavy metal, influenced by bands like Metal Church; King Diamond; Metallica; S.O.D. and Slayer. It was the first of my bands to receive airplay! We were played on Z-Rock Radio nationally and in Denver; Colorado. There were six members of the band over the years! The remastered demo is available directly through me for special friends and fans! To this day Onyx Rook remains an underground fan favourite! There are no web sites! Cat Bleu is a three-piece group which has that blues-disco-funk-rock-metal sound! 'The Cat' has an attitude! We just released "Don’t Bury Me" and I've heard that Bryan Spainhower is working on new material! Bryan and Brian Nicks co-write most of the Cat Bleu material. Navigator is my solo project. I'm currently working on a new release called “Song For You” which has been two years in the making. I think it will be a song that many can relate to as it evolved over a lost relationship! I’m very proud of what I’ve been able to accomplish in my studio for Navigator and my ELO influence really shines through with this newest song! Fragile X stems from my old day job where I worked with special needs children - more specifically - those suffering from Fragile X Syndrome - a genetic disorder of the male 'X' chromosome that causes mild to severe birth defects. My goal was to form a band that could help raise awareness and financial aid to help fight against this horrible affliction. Please consider donating to the National Fragile X Foundation! The band Fragile X consists of four members and is heavily influenced by ELO! We released our first album "Drop In Time" back in 1996 just before opening for ELO Part II. Fragile X is now resurfacing and gaining international popularity as we speak! All of the original members as well as new studio musicians from my other bands are all file sharing music and currently working on several new songs. We plan to remaster and release a number of great, never-released songs from the past such as "Poison Arrow"; "Epic" and "Under The Radar" along with new material. Lance and I are re-energized, and we are working very hard to get everything released as soon as possible! Imaginos is the newest three piece group. We hired two ladies to give our first album "Pathways" that elegant, Gothic contrast to its metal edge! We've been told that Imaginos have probably some of the prettiest hard rock music out there! It is currently receiving airplay throughout the US and UK. Savatage - who are loved by both Brian Nicks and me - were a very strong influence for the album "Pathways"! Being progressive and calling upon influences from the past, there are also shades of Pink Floyd, Rush, and ELO in the Imaginos sound! Imaginos have also been compared to Evanescence - and that is an honour too! I’m very proud of this project and album since it was done entirely within our own studios. Imaginos are currently working on the follow-up album to "Pathways" and I am currently in rehearsal to record the drum tracks for the next two songs! The invasion continues! KJS: Please could you tell me about some of the characters in those bands, Sean? 'Onyx Rook' were Mike Wolff [main writer and lead guitarist]; Chuck Gillespie [lead vocals and guitar]; Chris Aderhold [rhythm guitar]; George Chisholm [bass and backing vocals] and Tim Lawrence [lead vocals]. I think you know who the drummer was! We were very young and dreamt of being rock stars! Boy were we naive! The music was heavy and we had quite the following, but immaturity was at its peak for all of us! There is no substitute for age and experience! Most of us are now apart physically but we keep in touch through email and Facebook! I am working with guitarist Chris Aderhold again! I am very pleased to have him back on board as his writing and guitar work add a new and exciting element to the band! Cat Bleu is Brian Spainhower [lead guitar and vocals]; Brian Nicks [bass guitar and vocals] with yours truly [Sean Page!] on drums and vocals. Brian Spainhower [a.k.a. "Spanky"] is heavily influenced by Jimmy Hendrix. He even won "Best Guitar Player" in Denver CO at the local Grammy Awards! Brian Nicks is a wicked bass player and sets the groove for Bryan and myself. Brian wrote the recent release "Don’t Bury Me". I do a little drumming on all the Cat Bleu songs and even sing lead vocals on "Open Mind"! Navigator: "Beyond The Galactic Rim” was my first attempt at writing and composing songs on a piano! With the exception of "Thinking of Home" and "Hyperdrive"; this six song CD consists of self-written and self-produced songs that give you a spirited look into the future of space exploration on the edge of the Galactic Rim - not dissimilar in theme from the "Time" LP by ELO. "Thinking Of Home" was written by Keith Stewart along with the music for "Hyperdrive". George Chisholm played bass on "Hyperdrive" and I played all the other instruments - and all the vocals! These were the first tracks produced and recorded in my studio! I learned a lot in the process. This will come out in the new recordings for all the bands that I'm involved with! "Song for You" will be my latest 'Navigator' release! Work continues on the "Bone Planet" concept album once again, thanks mainly to the addition of Chris Aderhold on guitar! Fragile X: Lance Allred [lead vocals and songwriter]: He loves studio work; motorcycles and is currently based in Branson MO. He is very excited about the opportunity to write and help produce past and present Fragile X tunes again - whilst working with the original group - and our pals Mark Fisher; Bryan Spainhower and hopefully Brian Nicks! Lance’s buddy Martin Schroeder is playing bass guitar on our new tune "I’m Going Home". Lance is currently utilizing the talents of a great producer and has access to world famous studios like "The Mansion". Jeremiah Riggen [lead guitar and backing vocals]: Jeremiah’s guitar playing is excellent and very unique. He is into video games and music in his spare time. He is the father of a beautiful daughter! George Chisholm [bass guitar and vocals]: George is the lead vocalist on "No Longer" from the CD "Drop In Time". He is also the father of two beautiful daughters and is currently residing in Florida. He plays live with several local area bands. Although now spread out throughout the US, this group realizes the importance of putting their heads back together to help this exciting music resurface and be made available to the masses! Imaginos are led by originator Brian Nicks [lead/backing vocals; lead; rhythm and bass guitars AND keyboards! Brian’s writing and musical abilities are phenomenal. He and his family reside in Colorado. He is deeply involved in family activities and also enjoys karate! Brian works with computers in his day job! Mark Fisher [lead; rhythm and bass guitars; keyboards and backing vocals]. Mark is an exceptional musician and contributes immensely to anything he is asked to do! He is a true professional! In his spare time he climbs the Colorado Rockies! He lives in Colorado with his wonderful family! Yours truly [again! ]: Sean Page [drummer; drummist; drums; percussion; backing and lead backing vocals! ]; I also co-wrote "I, King". I spent a lot of time in my Navigator Studios and almost went mad helping to produce the first Imaginos album "Pathways"! I did all the drums to a click track so they are tight! I also did them "old school" in a two track format. The drum kit is a whole instrument this way, so they sound really good! However, I now track in eight separate tracks because editing and mixing the drums is much easier on Brian and the engineers this way! We both learned a lot in the production of this album! It took us two years to complete. We’re very proud of the final product! Awesome to have the female talents of Elise Winters and Laura Clarke on the "Pathways" disc too! Great voices! What a great job they did for us! We all learned a lot during this experience, and the next Imaginos album is currently in the works! KJS: Besides your ELO interpretations; I’ve been impressed with the music you have written; co-written and performed. Personally; I really rate “Winter Gift” on the ‘Imaginos’ “Pathways” album; “Colorado Way Of Feeling” and “World Apart” by ‘Fragile X’ and a few others! What inspires you when you put pen to paper, Sean? My inspiration comes from my life experiences and my imagination. I wish I could take credit for the majority of the writing, but I can’t! My hats off to all the guys - they are the genius' behind most of the writing for the majority of the songs. Being a drummer, I am a little slower when it comes to writing songs, but I do contribute! I create the original framework for all of our songs to a click track with scratch tracks! Writing; composing; engineering; recording and performing music in 'Navigator' alone has allowed me to express my feelings and emotions on the piano; keyboards and drums. And it’s almost like I don’t have a choice! I have to do it! I also really enjoy singing! All my music comes from the heart! KJS: You have had the good fortune to cross paths with ELO on a few occasions. What do you recall from attending one of ELO’s 1982 ‘Time’ tour shows in the US? SMP: It was my second big concert. I was twelve years old at the time and I had to take my little sister with me but we had a blast! I was blown away. ELO were awesome; the experience made me like them even more; the Robot was super cool; as was the excitement of just being there at a huge arena concert! The McNichol Arena in Denver I believe! I wish I could have bought a T-Shirt! My dad sees it a little different, he looked for us all around the perimeter of the building but we were waiting on the opposite side of the building from where we had told him to pick us up! He says he didn't hold ELO responsible but I guess he was pretty scared; thinking we had been kidnapped or lost! We had no idea what Pop went through - just so we could see ELO! My fave concert of all time! I think this is what made me want to become a drummer, but there is certainly more to that story! KJS: Was that where your love of ELO began? SMP: No! It began on my bicycle with a transistor radio hanging from the handlebars when I was about eight or nine years old! I knew some of their songs, but I didn’t know the band yet! I just knew I liked the music! It rocked! In 1979 I bought my first ELO album "Discovery"! I absolutely love "Don’t Bring Me Down"! KJS: As an articulate percussionist yourself, can you tell us why Bev Bevan is your drumming inspiration? SMP: Very thoughtful of you Keith! The ELO "Time" concert and the Black Sabbath "Born Again" tour are really what got me interested in Bev Bevan. He was the drummer for my favourite band ELO, and now also Black Sabbath! I was star struck! Bev was a rock star and I really wanted to be just like him! The way he plays drums to specific songs can be so cool. For example, his drumming on "Roll Over Beethoven" and the entire ELO II record or CD [not the band - the album!] is amazing! Frenzied, energetic and difficult to play - or played with amazing feel! Bev’s drumming made me feel good! Doesn’t everybody love his drumming on "Fire On High"? Bev’s drumming makes hit records. ELO are not the same without him on drums! His drumming with The Move was second to none! Just listen to the song "Looking On" - it speaks for itself! The drum solo and the music in the second half of the song is all in a five feel. Very cool! In old drumming magazines, he is credited with being one of the greatest rock drummers in the world! His respect for other drummers and musicians is an inspiration to us all! I have had the honour of seeing Bev solo live more than once and even at 66 years young, he continues to inspire me to this day! Him and my dad are the same age! KJS: Tell me about your other percussion heroes and their influence on your style of drumming? SMP: Neal Peart [Rush] is the most technical drummer that I enjoy! I would hope that my own style lies somewhere in between him and Bev. Neal Peart is one of the greatest of all time! Jimmie Vincent from the big band era is also one of my favourite drummers! Sandy Nelson's "Let There Be Drums" influenced Bev and many other drummers including me! "Teen Beat" is pretty awesome! Kirk Arrington, the original drummer for Metal Church, is also very talented! Too many others to mention! KJS: What are your thoughts on the musical legacy of ELO’s predecessors The Move? SMP: I love them equal to ELO or Rush! The Move are under appreciated. However, I know that they have influenced many other musicians such as me and the band Cheap Trick. More ELO fans need to discover The Move! I would love to see the reformed version of the band! It’s cool that they are still rocking into their sixties! I certainly hope I can too! Move, Move, Move! KJS: Regular visitors to ELOBF and Facebook will know that back in 1996; your band Fragile X actually supported ELO Part II on their USA tour. What was it like being on the same stage as your musical icons? SMP: Wow! I used to tell people in High School that I would open for ELO someday! Dream big and your dreams sometimes come true. Mine did! It was an experience that I will never forget and I will cherish it always! Fragile X and ELO sounded really good through that big stage PA! We sold a lot of shirts and CD's that night! One of our best, if not the best gig ever! My 'Slingerland' set on stage next to Bev’s drum stack - is that awesome or what? KJS: Could you elaborate on what it was like spending quality time with the likes of Kelly Groucutt; Bev Bevan; Eric Troyer; Lou Clark; Mik Kaminski and Phil Bates at that time? SMP: We were supposed to go backstage, but due to the large crowd, it almost didn't happen! But thanks to my father, he got it done! Very hurried! It seemed to go by in a flash! Bev was really busy, and Kelly was the talkative one in the group and very sweet to my mother! What a gentleman - rest in peace my brother! Eric, Lou, Mik and Phil were all polite; very approachable and they made us feel great. We had a ball just hanging out with them and sharing some snacks and cold beverages! As my dad recalls, Bev was soaking wet! He worked really hard for this concert; as did the whole group! Just talking to Bev was enough to trip me all over my tongue! I even forgot to introduce my girlfriend at the time - not on purpose - whole other story there! Kelly was such a great guy, he was always friendly to everyone and never failed to say hello every time I saw them after that first meeting in Colorado. Bev was a little harder to get close to because he was in such demand and very busy trying to make time for everyone! I managed to get a great picture of him and me with him receiving one of our 'Fragile X' T-Shirts! The next thing I know, their manager is telling them to rap it up … they had a plane to catch ... the life of a rock star eh? I will never forget that night! KJS: It must have been the fulfilment of a dream to support your favourite band - but you also went onto record a great version of ELO’s seminal classic “Turn To Stone” with Fragile X that I play regularly on the 'KJS Suggests' radio show. How did that session come about? SMP: Fragile X were working in Rudy’s Studio in Denver CO around late 1999. We had a couple of extra studio hours that day and decided to lay down "Turn To Stone"! With one additional session, we finished the version that many folks get to hear today on "Hamilton Radio" and your show! Because it wasn't recorded live and because I was the biggest ELO fan, I got to sing it in the studio! Drummers almost never get to sing! Besides, according to my dad, I was the only one with a fake British accent! KJS: You’ve also worked on covers of other ELO songs including “Oh No Not Susan” with Steve Midgley. Do you have any plans to record other ELO tracks with your bands? KJS: Have you ever performed any ELO songs live and are you planning to attempt any in future? SMP: Yes! "Turn to Stone" by Fragile X - maybe! I would love to play ELO live again. It would be awesome! Getting out and playing live again is one of my immediate goals! KJS: You have a great professional and personal relationship with Hamilton Radio and DJ Gino DiPierro alias ‘Doc G’. Please tell us about your friendship with HR and Gino? How important is that musical partnership with HR and other radio stations to you and your ongoing projects? SMP: Hamilton Radio and Doc G are a breath of fresh air to the music scene; especially for the indie artists! He also plays bands that have been ignored by corporate radio. His play list is considerably larger and filled with more variety with more full length versions of songs than I have heard anywhere in radio! I consider Gino as my dear friend, and what he does for ALL artistes is unheard of in today's music scene. He is simply one of a kind and has streamed my music all over the world. He is the most unselfish and caring DJ in the industry today! No-one out there does it the way he does it. He truly listens to his listeners and values their input! I know that you feel the same way that I do and look forward to Fridays when we get to hear your 'KJS Selection Show' on Hamilton Radio. This is all because of Doc G! We are tied to this thing collectively, and our love for ELO and each other will help to change radio forever! I also have a deep respect for Dominic Forbes at 'Brit Rock' - who has aired Fragile X and Imaginos tracks - and has also featured Navigator on his show. 'Brit Rock' is also featured on many other stations worldwide. Stu 'n' Kendall’s "Friday Night Rock Show" on Harborough FM in the UK also plays Fragile X and Imaginos. It's an honour to be aired alongside of great well-known artistes like Rush and ELO, and to hear their wonderful compliments about my music! You guys rock! Thanks to my fans, friends, and these DJ's who have given my music air play; I am forever grateful! These relationships are all possible because of Gino DiPierro finding me on Facebook and offering to play my music! His connections, the promotion of my music plus your and Francis Pope's marketing skills in the UK, were the catalyst to my bands getting worldwide exposure! Not only on his station, but other stations as well. Shaz Pratt of 'The Light Shines On' is also playing Fragile X and Cat Bleu on her ELO show at Radio BackTrack and now on Hamilton Radio too! She is special too, and I am incredibly grateful for the opportunity that all of these DJ's are giving my bands. I know the other band members appreciate it as well! This is unheard of in today’s corporate music world. I want them all to know that it means the world to me! I also want to put a special thanks out there to my band members; without them, I am just a drummer! This is not about me, but all of us, and our quest to be successful! KJS: You have a remarkable bond with your incredibly supportive parents. Can you tell me about the role of your father Mack in your career? SMP: Simply put - my father is my manager! He is my biggest fan and critic! He gets things done that others can’t! Pop is the guy that made sure we got backstage with ELO Part II! For the whole world to know: I love my dad! My mom is an angel; and any son would be blessed to have a mom like mine! She is the most giving and caring person I know on Planet Earth. She helps me with all the little day to day things I sometimes can’t get to when the music takes over my day! My parents are my best friends! Family is very important to me. KJS: You have a growing collection of followers both online and on all radio frequencies! How important are those fans to you? SMP: Keith, I have been at this since I was 16 years old. The DJ's have been incredible in their support! Sean Page's 'Army' of friends and fans are essential, and also extremely important to the success that I have achieved. Without them I would be nowhere. I want to personally thank each and every one of them for their support! There are numerous friends and fans that go way beyond the call of duty to help promote my music, there are too many to mention individually without forgetting somebody. They know who they are! No man or woman left behind! The invasion continues! KJS: What musical projects is Sean Mack Page working on right now here in 2011? SMP: Fragile X; Imaginos; Navigator and Cat Bleu. Right now, I am working on a number of songs for all of the bands. I am also currently rehearsing with Chris Aderhold of Onyx Rook! It's more than enough to keep me busy! KJS: Now a question I ask very interviewee here on ELOBF: What are your favourite songs of Jeff Lynne; ELO; The Beatles and [naturally] The Move? SMP: ELO songs: "Secret Messages"; "Ticket To The Moon"; "In Old England Town"; "From The Sun To The World" and anything off "Electric Light Orchestra II" [the album that is!]. For ELO there are many other favourites depending on my mood. I mentioned the ones that came to mind today! The Beatles: "Strawberry Fields Forever" and "Eleanor Rigby". The Move: "Looking On"; "Fields Of People"; "The Last Thing On My Mind" and "Beautiful Daughter". "Shazam" was my first Move album! KJS: Finally, with five bands, there must be many ways for folks to get a hold of your music and catch up with what SMP is up to. Can you please tell folks of the many ways they can keep in touch; contact you and purchase or download your music? KJS: I would like to take the opportunity to thank Sean for participating in this trans-Atlantic interview. SMP: Keith, thanks so very much for your help and support. Without ELOBF, Frances Pope and Gino DiPierro - my music would still be sitting on the shelves of corporate radio collecting dust! Because of you folks, 'Sean Page's Army', my band members, the other DJ's, friends and fans, I am successful. I'm now on worldwide radio with the continued support of the ELO family! Thanks again so much my friends! ELO Beatles Forever [ELOBF] recommends the many musical activities and outlets of Sean Mack Page to those enlightened folks who enjoy the music of ELO, Jeff Lynne, Roy Wood, The Move, The Idle Race, 'Brum Beat', The Beatles and related artistes.